Travels around the globe helped define and affirm a love of Modern design in both Jerry Peters and Rick Ramsey. Inspired by the eclectic blend of old and new throughout the city, they set out to explore and celebrate modernist ideas in the design and construction of their new home in Richmond, Virginia. Involved in all aspects of the project, Peters and Ramsey worked closely for more than a year with a team of carefully selected designers, craftsmen, and contractors to create a home that embodies their personalized, modern aesthetic. Influenced by the hobbies and interests of the owners, the design uses several modern architectural and landscaping elements to bring the outside in. The siting of the west wall (large brick wall) creates the key alignment for both the main entry and the main interior living space of the home. From the sidewalk, the widening angle (towards the street) is inviting and creates the approach from the sidewalk up to the main entry which is actually located on the “side” of the house. Inside, this wall continues through to a large expanse of glass panels that can be opened to essentially extend the living area out to the private backyard and pool area. The front two rooms on the ground floor, the library and the guest bedroom, are designed as enclosed private spaces that provide a layer of visual and noise privacy from the street. The surrounding public spaces on the ground floor (living room, dining room, and kitchen) are interconnected and they open out to the outdoor space. The second level is a set of bedroom suites, each with an office, bathroom, storage, and sleeping area. The common hallway on the second floor connects the stair and elevator to each suite and leads to a shared exterior balcony. Below grade, the basement offers ample storage in addition to a guest room, full bath, and billiards room. 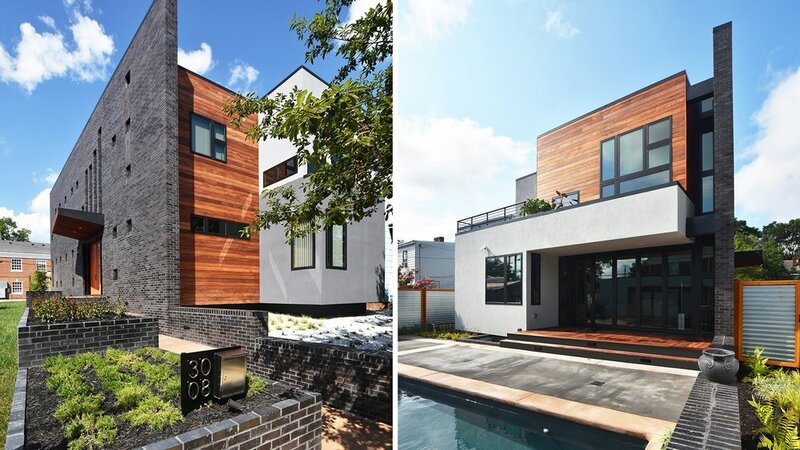 The exterior of the house is broken up in massing and by a collage of three different cladding materials: black brick, reddish orange tigerwood, and stucco in two different shades of grey. Beginning with a concept floor plan, the owners approached Trey Tyler of RenderSphere to discuss 3D visualization as part of the early design process. Drawing on his education and experience as an architect, Trey collaborated with Jerry and Rick over several design & visualization “work sessions” to refine that initial layout into a cohesive design concept for the project.